I've heard people say they have anxiety attacks and I think to myself how's that possible. It’s just pure emotions and you should be able to control it, right? Well, lets just say that's why it's called an attack, your feelings and emotions pretty much attacks you and I can say that I have experienced this attack in a small dose. Some few days ago I was sitting minding my own business when a thought came to mind. I started thinking about it and I couldn’t get it out of my mind. That lead to me thinking about things I had no business thinking about. Oh, and they weren’t pretty thoughts. In that moment my heart began to beat faster and my stomach started to turn. I felt like I was going to throw up, cry and stop breathing at the same time. 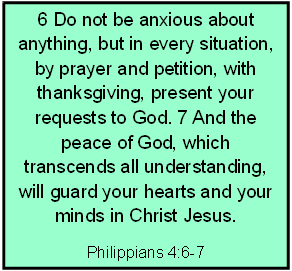 After the little rush or episode, whatever you want to call it passed, I took a couple of deep breaths to calm myself down and then a passage popped into my head, it was Philippians 4:6-7 . I went to the passage and read it to myself. After reading it a couple of time I had it committed to memory but I found I felt much better when I read it out loud to reassure myself. So, I went ahead and wrote the passage on a sticky note and placed it right in front of me. I looked at it and read it to myself every time I start getting that feeling and I felt at peace. What I’m trying to get at is that God’s word works and its there to guide, teach, protect, comfort, heal and just be everything to us. As I reassured myself with these words over and over again, I came to the realization that God’s words and instructions are very simple. Too simple to the point that sometimes we overlook them or even complicate them. So on this day, I did just what the word said to do. What the passage was telling me to do to overcome that moment of panic was very simple, pray, gives thanks and present my requests to God. At the end of the day I had peace about the matter. Peace of mind that can only come from above because all those negatives thoughts have actually turned into positive thoughts. There is a passage in the bible to get us through whatever we encounter in life. All we have to do is read, meditate, pray, do what it say to do and leave the rest to God. Sometimes, I feel like we read, we pray but we forget to do; to do our part. God is not going to do your part. You begin where He stops, so you have to make a move somewhere on your part to bring the work to completion. Are you anxious about anything, don’t be because He said not to be anxious for anything. Instead in that moment, let the peace of God reign and come into you by praying, by giving thanks and be presenting your request to God. This applies to every area of life; whatever you may be going through, find that passage that speaks to it. Confess it, pray it, and do your part. Do whatever it says to do or not do and leave the rest to God. And if you have been doing it all, keep doing it. Habakkuk 2: 3 For the revelation awaits an appointed time; it speaks of the end and will not prove false. Though it linger, wait for it; it will certainly come and will not delay. The word of God never fails. Thanks Christiana for this post. It came at a much needed time. In our human nature i feel it's easy to become anxious and loose some faith. We definitely have to remember that God will never fail us. I'm glad it came to you at a good time and it meant something to you. Thanks for leaving a note.